Khaidu was a ghostly apparition – a figure at the periphery of Khubilai Khan’s world that never left him alone. He would pick and poke at Khubilai’s defences for the rest of Khubilai’s life, occasionally seizing territory outside his fiefdom, occasionally retreating into the steppes. He darted towards Karakorum itself, as if hoping to convene a rebel kurultai. He meddled in Tibetan affairs in an attempt to foster anti-Mongol feeling in the monasteries; he put out feelers to disaffected princelings on the other side of China, in the hope that together they might rise up against the sons of Tolui. Khaidu would even outlive Khubilai by a few years, but never quite got enough support to mount a true challenge. Had Khubilai and Khaidu been duelling over nothing more than Mongolia, perhaps Khaidu would have had the upper hand. Ironically, the very Mongol-based feud that Khaidu perpetrated served to drive Khubilai further towards a Chinese perspective. Without China, Khubilai might not have had the support he needed to shrug Khaidu off. Marco Polo found the whole thing baffling, but far more interested in stories circulating about Khaidu’s daughter, a towering Amazon whose name he recorded as Aiyaruk (‘Bright Moon’). Her father often desired to give her in marriage, but she would none of it. She vowed she would never marry till she found a man who could vanquish her in every trial; him she would wed and none else. And when her father saw how resolute she was, he gave a formal consent . . . that she should marry whom she wanted and when she wanted. The lady was so tall and muscular, so stout and shapely withal, that she was almost like a giantess. Khaidu had set himself up as the protector of old-time Mongol values, in opposition to Khubilai the Sinophile. It was hence only to be expected that Khaidu’s daughter was set up in local legend as some sort of woman warrior, who boasted that she would only marry a man who could beat her at wrestling, and that anyone who failed in this would have to pay her 100 horses. Aiyaruk supposedly successfully fought off 1,000 challengers over the course of the 1270s. Perhaps a little worried that his daughter might be getting long in the tooth, Khaidu is even reported as suggesting that she should try to let the next one win, but she refused, and won another hundred horses for the family herd. With a tacit admission that nobody was going to be good enough for her, she gave up on men entirely and accompanied Khaidu on his endless war against Khubilai’s warriors. And ye must know that after this her father never went on a campaign but she went with him. And gladly he took her, for not a knight in all his train played such feats of arms as she did. Sometimes she would quit her father’s side, and make a dash at the host of the enemy, and seize some man thereout, as deftly as a hawk pounces on a bird, and carry him to her father; and this she did many a time. The story would grow with the telling, particularly in Persia, where legends arose about a king of ‘Turan’ (Persian: Central Asia), whose beautiful daughter insisted that any suitor should overcome a series of trials in order to win her hand in marriage. The story flourished in several variants as The Daughter of Turan, in Persian: ‘Turan-dokht’. Who shall solve the riddles which she shall set. He must submit his proud head to the sword! 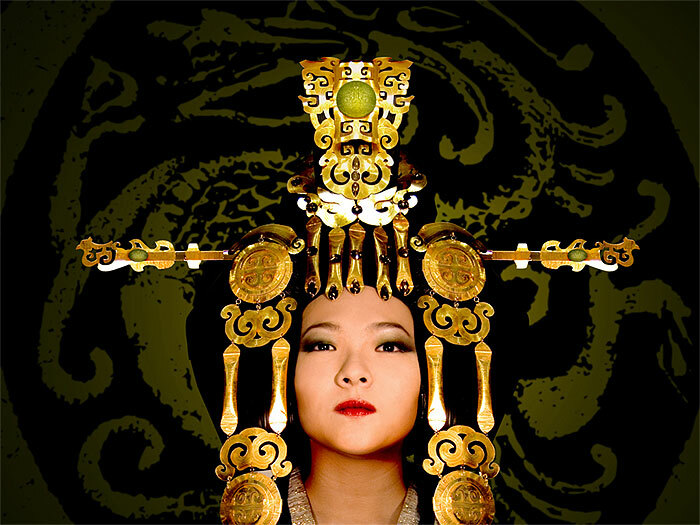 Puccini’s Turandot is a world away from Khaidu’s real-life resistance in western China. It retains garbled concepts of China and Tartary, and mixes elements of Mongol and Chinese culture. Nevertheless, it is fascinating to see a strand of true history informing a strand of modern life. Khaidu would eventually die in 1301, from wounds received in a failed strike at Karakorum itself – but his daughter, or a phantom of her, would spring to life on the opera stage in Milan six centuries later. From A Brief History of Khubilai Khan by Jonathan Clements.